Treating presenilin-2 (PSEN2) mutation bearing human neurons with insulin corrected mutation-related abnormal electrophysiological abnormalities. The research team said the finding suggests there exists a neuronal molecule or pathway where insulin signaling intersects with calcium signaling, PSEN2, and the biogenesis of amyloid-beta. Scientists trying to understand how type 2 diabetes (T2D) doubles the risk for dementia are using induced pluripotent stem cells (iPSC) to assess human brain neurons from various patients to determine whether any feature of T2D can be intrinsically generated by these brain cells. The first familial Alzheimer's disease (FAD) mutations that were studied employed cells derived from people who carry the presenilin-2 (PSEN2) mutation, and the first test sought to determine whether iPSC-derived PSEN2-mutation-bearing human neurons showed any evidence of insulin resistance. They did not. But the scientists discovered something surprising: Treating the PSEN2-mutation-bearing neurons with insulin corrected mutation-related abnormal electrophysiological abnormalities. “This unexpected rescue of the electrophysiological abnormality of basal forebrain cholinergic neurons (BFCNs) raises the tantalizing question of whether insulin could have any place in sustaining BFCNs in living humans and whether treatment with insulin might delay their degeneration in AD,” said Sam Gandy, MD, PhD, professor of neurology and psychiatry and Mount Sinai Chair in Alzheimer's Disease Research and director of the Mount Sinai Center for Cognitive Health and NFL Neurological Care. Dr. Gandy is senior author of the study, published in Molecular Neurodegeneration. His colleague, Scott Noggle, PhD, at the New York Stem Cell Foundation, developed the first recipe for creating these BFCN cells in a dish. These cells are the first to die in AD. “BFCN integrity is most closely related to the well-known amnestic syndrome of AD; therefore, extending BFCN lifespan might delay or slow onset of amnesia, one of the first disabling signs of AD,” added Dr. Gandy. The relationship between T2D and dementia is not well understood. Some scientists argue that dementia in T2D is caused by Alzheimer's disease, while others contend that dementia in T2D is a subtype of vascular dementia, which could, in turn, increase the risk for AD and lead to mixed dementia pathology. One puzzling observation is that none of the known T2D risk genes has any obvious hand in regulating brain insulin signaling. So far, there is no cellular or molecular model for how brain insulin resistance or cognitive decline develops in T2D patients. Dr. Gandy and his colleagues started with a simple question: Is there something about expression of FAD mutations that perturbs insulin signaling in these vulnerable BFCNs in people destined to develop Alzheimer's? To answer this question, they turned to scientists at Harvard Medical School. Rudolph E. Tanzi, PhD, the Joseph. P. and Rose F. Kennedy professor of neurology at Harvard Medical School and vice chair of neurology and director of the genetics and aging research unit and co-director of the McCance Center for Brain Health at Massachusetts General Hospital, and his colleagues were the first to discover the PSEN2 gene and the PSEN2 gene mutations that cause familial AD. Several individuals from one of Dr. Tanzi's families agreed to share their fibroblasts, which were used to cultivate induced pluripotent stem cells, and these cells were coaxed into becoming BFCNs. They also used genome editing technologies to correct the PSEN2 mutation that causes FAD. The researchers had previously established (together with Dr. Gandy and Dr. Noggle) that the best way to confirm that a newly discovered cellular “problem” with iPSC-derived neurons was truly caused by a PSEN2 mutation was to use genome editing to correct the mutation in those identical cells taken from the skin of Tanzi's patients. If the “problem” disappeared when the PSEN2 mutation was corrected, that was powerful proof that the “problem” was entirely caused by the PSEN2 mutation. Cesar Moreno, PhD, now a neuroscientist at the University of Queensland in Brisbane, was a postdoctoral fellow, working with Dr. Gandy, Dr. Noggle, and Mount Sinai molecular endocrinologist Christoph Buettner, MD, PhD, a professor of in the department of medicine. Dr. Buettner had previously discovered that mice expressing AD genes in their brains showed insulin resistance in their peripheral tissues. In earlier studies, Dr. Noggle and Dr. Gandy reported that PSEN2 mutations caused an intrinsic disturbance in calcium metabolism that led to electrophysiological abnormalities. This led the scientists to wonder whether insulin might have some effect on the PSEN2-mutation-linked electrophysiological disturbance. Dr. Noggle decided to assess whether the doses of insulin had any impact on the intrinsic abnormal calcium current caused by FAD mutations in PSEN2. Surprisingly, insulin dosing caused normalization of the PSEN2-related electrophysiological disturbance. “This suggests that there does exist some neuronal molecule or pathway where insulin signaling intersects with calcium signaling, PSEN2, and biogenesis of amyloid-beta,” Dr. Gandy explained. The researchers will now repeat the studies using iPSCs from other PSEN2 families, as well as iPSCs from people with other AD disease mutations (PSEN1 and APP). One question these unexpected findings raise is whether there is any place for insulin therapy in the management of patients with PSEN2 mutations. In addition to the corrective effects of insulin on calcium signaling and amyloid-beta 42/40, the iPSC results also got them thinking about the possibility that insulin might prolong the survival of BFCNs in PSEN2-mutant FAD. “The death of these cells is a major limitation to the use of cholinesterase inhibitors (ChEIs) because for ChEIs (like Aricept) to work, there must be BFCNs generating acetylcholine,” said Dr. Gandy. The study was funded by the Mount Sinai Alzheimer's Disease Research Center. “This is an interesting study,” said Yanling Wang, MD, PhD, associate professor at the Rush Alzheimer's Disease Center and the department of neurological sciences at Rush University Medical Center. “Although numerous postmortem and animal studies have indicated that AD and cognitive impairment may be linked to disrupted insulin signaling in the brain, I think that the seemingly negative results from this study do not conflict with previous studies. The reasons: The study uses iPSC-derived BFCNs, which only represent one brain region and are relatively young neurons, not aged neurons in AD or dementia and the treatment is acute. The insulin resistance may develop over time in the aged brain. •. Moreno CL, Guardia LD, Shnyder V, et al iPSC-derived familial Alzheimer's PSEN2 cholinergic neurons exhibit mutation-dependent molecular pathology corrected by insulin signaling https://molecularneurodegeneration.biomedcentral.com/articles/10.1186/s13024-018-0265-5. Mol Neurodegener 2018; 13(1):33. •. Arvanitakis Z, Capuano AW, Leurgans SE, et al Relation of cerebral vessel disease to Alzheimer's disease dementia and cognitive function in elderly people: a cross-sectional study https://www.thelancet.com/journals/laneur/article/PIIS1474-4422(16)30029-1/fulltext. Lancet Neurol 2016;15(9):934–943. •. Arnold SE, Arvanitakis Z, Macauley-Rambach SL, et al Brain insulin resistance in type 2 diabetes and Alzheimer disease: concepts and conundrums https://www.nature.com/articles/nrneurol.2017.185. Nat Rev Neurol 2018;14(3):168–181. 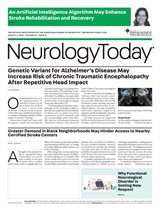 Neurology Today18(22):7-8, November 15, 2018.